Fundamentals: Major U.S benchmarks are unchanged this morning with geopolitics in focus. The economic calendar is bare to start the busiest week of the year and the world awaits President Trump’s groundbreaking meeting with North Korean dictator Kim Jung Un this evening in Singapore. Markets finished Friday on a strong note and saw leadership from Consumer Staples and Health Care. Financials put in a strong week last week, recovering from the prior. While the XLF faces some technical headwinds, it will be a key sector to keep an eye on this sector as we expect tremendous volatility in yields with central banks in focus. Also, there is a 10-year auction at noon CT today. Lastly, Apple lost 0.9% on Friday due to disappointing parts orders, if it struggles early it could be a leader in risk-off sentiment. Technicals: Our Neutral Bias approach on Friday emphasized that there are trading opportunities from either side. Friday’s strong close cannot go ignored but we do feel the upside is becoming limited in the very near term. The slightly lower open last night gives a solid line in the sand for a marginal Neutral/Bullish Bias. First key support comes in at 2771.75-2774.75; a move below here today will completely neutralize all of Friday’s strength. Furthermore, a move below our minor level at 2766.75-2767.50 will give the bears an edge in the very immediate term. While the bulls do have an edge this morning, if price action holds or trades above 2782.50-2786.75, further buying is likely to come to the table and a close out above here will make our Bias more Bullish. Last week’s close: Settled at 65.75, down 0.21 on Friday and down 0.07 on the week. Fundamentals: OPEC’s June 22nd meeting is quickly coming into focus and the price of Crude Oil has suffered despite tensions between members running high. There were reports last week that Saudi Arabia added 100,000 bpd last month. Additionally, data to start the month suggests Russia has increased production to 11.1 mbpd, higher than the rough 11 mbpd ceiling they agreed to. Crude was working to recover from its sharp selloff through May 29th but saw further pressure last week after news broke that a high ranking White House official asked Saudi Arabia to increase production in order to offset Iran sanctions before the White House announced their decision. Crude Oil has already dropped more than 10% from its peak on this news. Price action will stay volatile, but we steadily maintain that the risk is to the upside. Furthermore, we believe the highest producing nations of the OPEC and non-OPEC accord are taking advantage of what has become a gray area of compliance ahead of the official OPEC meeting. OPEC is due to release their Monthly Report tomorrow morning and the IEA releases theirs Wednesday ahead of inventory data. Technicals: Crude Oil is down about 1% this morning and despite signs of strength heading into Friday, major three-star resistance at 65.80-66.08 won another battle. Yes, fundamentals are weighing on the tape today, but do no be mistaken, Friday’s failure against this strong level of resistance has paved the way for the bears. On Friday, we pointed to a potential bear flag developing due marginal higher highs and higher lows; Friday’s price action and that into this morning has played right into this pattern. While we see tremendous long-term value down here, buyers must remain cautious and even more so upon a close below first key support at 64.73-64.99 which aligns key technical levels, the 100-day moving average and the low close on this swing. Fundamentals: This is the week that both the bulls and the bears have been waiting for. It kicks off with the groundbreaking meeting between President Trump and North Korean dictator Kim Jung Un Monday night (U.S hours). Tuesday, we see fresh inflation data with CPI. Next comes a trio of central bank policy meetings, the Federal Reserve on Wednesday, the ECB Thursday morning and the Bank of Japan late Thursday night. Volatility in the currency market will be critical to the Gold trade, a stronger Dollar will weigh on the metal while weakness will lift it. There is no data on the U.S calendar today, but a 10-year Note auction comes at noon CT.
Technicals: Thursday was yet another failed attempt to get out above major three-star resistance at 1308.7-1309.6. Still, price action has battled like a champ to hold the psychological $1300 mark. According to the Commitment of Traders, Managed Money began repositioning long Gold, but still remains at the lowest level in a year. This signals that if Gold begins moving higher, out above major three-star resistance, it is likely to garner buying. Traders should keep an eye on Silver, it has lagged Gold until recently, showing spurts of strength, if it can get above 17.20 area there is room to run and lead to the upside. Fundamentals: Natural Gas continues a consolidation phase and buyers defend pullbacks with the prospects of a higher demand for cooling days quickly approaching. The 10-day forecast calls for temperatures hitting above 90 degrees in the Midwest with the East Coast following behind. We maintain that the overall fundamental risk is to the upside through July, but question where the value is. Technicals: Price action traded to a low of 2.875 on Friday, higher than that from Wednesday. A positive start to the week has continued to build a base above major three-star resistance at 2.85-2.864 which also closely aligns with the 50, 100 and 200-day moving averages. Fundamentals: The biggest week of the year gets underway. Tonight’s meeting between President Trump and North Korean dictator Kim Jung Un kicks things off, but there is a 10-year auction at noon CT in an otherwise bare economic calendar to start the week. We discussed last week that it is likely to see pressure on the 10-year ahead of Wednesday’s FOMC Meeting, after all, we are in a hiking cycle. Equity markets continue to trek higher and this has only encouraged that pressure. We still feel it is likely, depending how things play out, that the 10-year bottoms, at least in the near/intermediate term, over the next week and a half. Technicals: Price action is back below our crucial pivot level but managed to settle within it Thursday and Friday. We like patiently positioning long on dips, first key support at 119’05 held last week. Still, this will not be an easy trade considering the volatility ahead. Last Week’s Close: December corn futures finished Friday’s session up ¼ of a cent, trading in a range of 5 ¼ cents. Futures finished 13 ½ cents lower for the week. 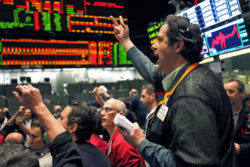 Friday’s Commitment of Traders report showed that funds sold 102,094 futures from May 29th to June 5th, this shrinks their net long position to just 78,696 futures. Fundamentals: There is a lot of news on the horizon for the grain markets this week, first off is the weekly export inspections later this morning. After the close we will get an updated look at crop progress. Corn ratings are expected to come in at 78% good/excellent, unchanged from last week. More significant data will be released tomorrow morning with CONAB releasing their estimates for South American production. At 11 am cst we will get an updated look at the USDA supply and demand estimates. We also have the North Korea/US summit which could have big implications on commodity markets too. The cherry on top is the ever-changing weather forecasts. Technicals: There has been a tremendous amount of technical damage to the chart over the last two weeks, that has brought the RSI (relative strength index) to 32.87, the most oversold level since November. The market is trying to hold ground near the 200-day moving average which comes in at 397 ½ to start the week. If the bulls can achieve consecutive closes above this indicator we could see the market start to repair some of the damage on the chart. Our pivot point this morning comes in from 397 ½-398 ½, a move above that has us looking towards 404 ½-405. On the support side of things, 391 ½-394 is the pocket that the bulls need to defend. A break and close below could encourage additional long liquidation down towards 379 ¼. Last Week’s Close: November soybean futures finished Friday’s session down 4 ¾ cents, extending the losses for the week to 51 cents. Friday’s Commitment of Traders report showed that funds sold 38,413 futures from May 29th-June 5th, this puts their net long position at 65,177 futures. Fundamentals: As mentioned in the corn section, there is a lot of new news this week which will likely keep the volatility alive. To kick things off we have export inspections later in the morning, then after the close we get an updated look at crop progress. Good/excellent ratings are expected to be near unchanged from last week. Tomorrow CONAB will be releasing their estimates for South American production, following that we will get an updated look at the USDA’s Supply and Demand estimates (we will have our estimates out in tomorrow’s report). We also have the North Korea/US summit which could have big implications on commodity markets too. The cherry on top is the ever-changing weather forecasts. Technicals: The market has sold off 76 ¾ cents in the past two weeks, leaving behind what looks like a technical graveyard on the chart. The pressure on the market has brought the RSI (relative strength index) down to 32.38 which is just shy of “oversold conditions” but the most oversold since December, when we started to form a near term base. Previous “support” now becomes first resistance to start the week, that comes in from 997 ¾-1002 ¾. On the support side of things, there doesn’t look to be a lot until 967 ½-974. Expect volatility to remain elevated for the first half of the week. Last Week’s Close: July wheat futures finished Friday’s session down 4 ¼ cents, shrinking the gains for the week to just ¼ of a cent, after trading in a 33 ¾ cent range. Friday’s Commitment of Traders report showed that funds sold 2,768 futures from May 29th-June 5th, shrinking their net long position to 23,058 futures. Fundamentals: Wheat has managed to find more stabilizing fundamentals which has prevented it from rolling over along with corn and beans. Hot and dry weather in the Black Sea region and Australia has helped provide a temporary floor in the market. If that trend starts to change, we could see the market play catchup to corn and beans. The weekly crop progress report will be released after the close, that is expected to show spring wheat ratings near unchanged from last week. Tomorrow morning the USDA will release their supply and demand estimates for June, we will have our estimates in tomorrow’s report. Techncials: The market is consolidating in the middle of a 13-month range as the bulls and the bears wait for new news to give us that breakout or breakdown. The chart looks relatively constructive after holding significant support levels last Monday. The ability to hold support has marked higher lows which could take us to higher highs, a trend we have seen working for the past two months. First technical resistance comes in from 537-538 ½. On the support side of things, 502 ¾-505 ¼ is the pocket the bulls need to defend on a closing basis.